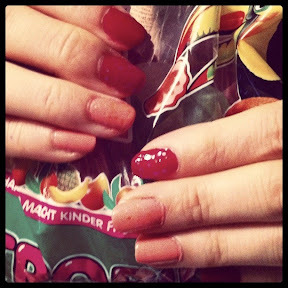 Today I want to show you the mani I had while in Germany. 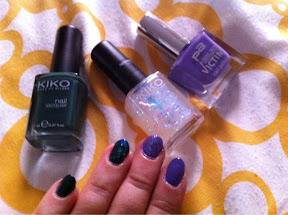 Since it was the first time I had some KIKO and P2 polishes, I wanted to try them out. I used Kiko 347, a beautiful forest green and P2 Poetic, a pretty purple. For a bit of a twist I used Kiko 270 on a couple of nails. Although it was a simple look, I got a lot of compliments. My friend T-chan loved it so much that she wanted it on her nails too but in pink and red. So I used Essence Flamingo Rose and Divalicious Red instead. so lovely :D didn't think that darkish green and purple would go so well! and of course <3 <3 for the Kiko 270! It's beautiful! 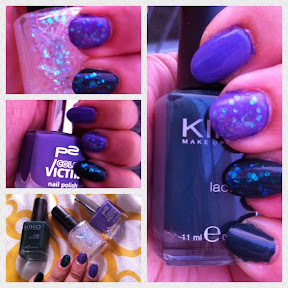 Kiko 270 gives the mani an even more glamorous look!